Where possible a photograph of the street has been added, as well as a link to the street on the 1911 census. Gambell’s Yard: Named after a family of the same name who had a business in the area. Gaol Lane Bow: (formerly Town Hall Lane) was named because of its proximity to the Tholsel, which was first of all the Town Hall and later was converted to a gaol. Gaol Borreen: Named due to its proximity to an old gaol. Garryglass: Located off the Golflinks Road, Castletroy. Garryowen (part 2) (part 3), Garryowen Villas: Comes from John’s Garden, as it is located in St. John’s Parish and was once the main supplier of fresh food to Limerick city. George’s Quay: (aka Barrington’s Mall), In 1760 the old town wall which ran from Quay Lane to Baal’s Bridge was torn down making way for George’s Quay. It is named after King George III. According to folklore the Abbey River separated husband and wife – King George III and Queen Charlotte, giving the names George’s Quay and Charlotte’s Quay. Photograph of George’s Quay. George’s Street, (Part 2), (part 3), (part 4) (part 5) (part 6): (now O’Connell Street) was named after King George III. St. George’s Church which once stood on the street before being replaced by St. Michael’s Church was also named after this king. Glasgow Park: named after Frank Glasgow who was elected Mayor of Limerick in December, 1961. Glenagross Park: gets its name Gleann na gCros, Glen of the Crosses, which is just north of the site. Glover’s Lane: This was located in the old Carey’s Road area. Glue Yard Lane: named from its proximity to an old glue yard, which it is said, was located on or near the site of the Old Meat Market, in the St. Francis Abbey area. 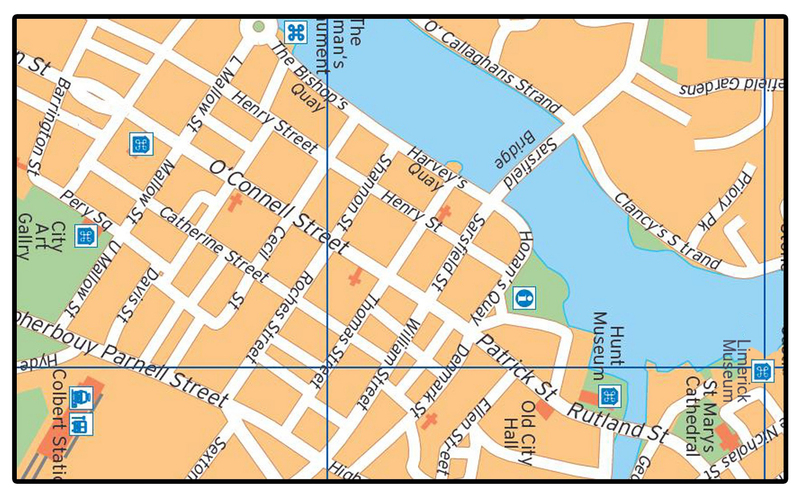 Goggins Lane: Located in St. Munchins Parish, parallel to Clancy’s Strand off Mass Lane. Golf Links Road: named due to it’s proximity to the Golf Course in Castletroy. Gorman’s Lane: In the Glentworth Street area. Grattan Street: named after Henry Grattan (1746-1820), during whose term in office, the British Parliament agreed not to pass laws which were binding in Ireland. As a result, the Irish Parliament, which sat between 1782 and 1800 was known as Grattan’s Parliament. Griffith Avenue: named after Arthur Griffith (1871-1922) President of Dáil Éireann from 10th January, 1922 until his death on the 12th August, 1922.